This is the story of how the Community Eligibility Provision helped Beach Park School District 3 provide breakfast to ALL students in the district. The story book opens to Beach Park School District 3. Today, Breakfast After the Bell programs run seamlessly district-wide in the four elementary and one middle school. So how did Beach Park District 3 get to this perfect school breakfast ending? Let’s start at the beginning…. eight or nine years prior to the 2015-16 school year the district operated under a breakfast waiver, meaning that the requirement to provide school breakfast was waived for the district. There were reasons why the district wanted such a waiver among them: no food service staff to help with breakfast and the cost associated with operating a breakfast program. We take a look in on Newport Elementary School in Beach Park District 3 under the breakfast waiver: The Principal of Newport Elementary School uses his/her own money to buy granola bars or other breakfast items children who came to school hungry could easily eat in the mornings. According to Share Our Strength’s 2013 Teachers Report $59.00 per month was the average amount principals spent on food for students in their schools. Over a school year, that could be as much as $500.00. A brief lesson on what the Community Eligibility Provision is: Illinois was one of the first states in the nation to adopt the Community Eligibility Provision (CEP). CEP provides an opportunity for schools to provide free breakfast and lunch to all students without the burden of collecting and processing school meal applications for free and reduced-price meals. Rather than individual eligibility determinations, schools that adopt CEP are reimbursed. Schools above the direct certification of 62% have 100% of meals reimbursed at the free rate. Beach Park School District 3 did an analysis of CEP, to see how it would be financially viable. “We looked at how we were going to deliver breakfast because we did not have a food service staff and guess estimated participation…..We were willing to take a loss financially if it meant our students would better be able to focus on school and not that they were hungry,” said Patrick Palbicke, Director of Business for Beach Park School District 3. The school district applied for and implements CEP. Not taking a financial loss, the district increased reimbursements from CEP which allows invest in staff to help with the implementation of Breakfast After the Bell programs. “CEP opened up the door to have existing staff,” said Palbicke. Cold breakfast is served district-wide to cut down on staff time. 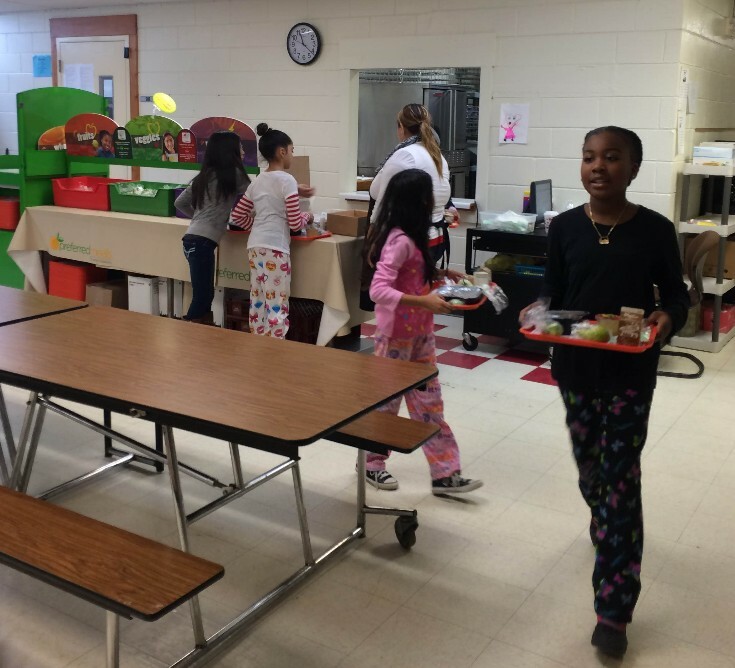 A school breakfast grant helped the school district purchase equipment and supplies to implement Breakfast After the Bell programs district-wide for the 2015-16 school year. School breakfast was the answer Beach Park School District 3 was looking for to improve kids test scores and attention in class, “behavior issues come from being hungry and children not being able to verbalize it,” expressed Palbicke. Since implementing Breakfast After the Bell programs nurse visits and tardiness have decreased. And what makes Beach Park School District 3’s implementation of Breakfast After the Bell so successful? “To get the best buy in we made the staff part of it,” said Palbicke. 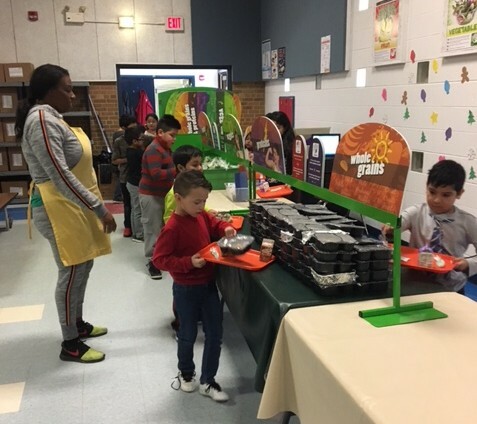 District-wide breakfast is free to staff as long as they eat with the students, after that it is left up to each individual school with how they want to implement Breakfast After the Bell. Present day Newport Elementary: Principal Shaton Wolverton started at Newport the same year Breakfast in the Classroom was implemented. “Staff plays a huge role to make sure everything runs smoothly,” said Principal Wolverton. Teachers/teacher assistants have an opportunity to help with the breakfast program. Teachers/teacher assistants ask each child if they would like breakfast the next morning. Once the count is collected from each class at the end of the day, the pre-packaged breakfasts are assembled, fruit is washed and bagged. The next morning, breakfast is delivered and eaten in the classrooms while teachers take attendance and/or review an extension of what has already been learned. “Parents aren’t always able to prepare breakfast in the mornings.” With Breakfast in the Classroom, “I know that kids are eating breakfast and are ready for learning and parents know their kids are being taken care of,” said Principal Wolverton. At Newport Elementary, teachers initiated the implementation of lunch in the classroom so classrooms can stay and eat together. As it is told and so it is, breakfast for ALL in Beach Park School District 3.